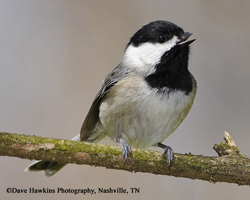 The Carolina Chickadee is found throughout Tennessee except in the very highest elevations of the Appalachian Mountains, specifically the Great Smoky Mountains National Park, where the Black-capped Chickadee, which very similar in appearance, is found. A regular visitor to the bird feeder, the Carolina Chickadee is a conspicuous species that is a favorite among bird watchers because of its energetic nature and identifying call, “chicka-dee-dee-dee”. This small species with a large head and short neck has a short bill, distinct black cap, throat and bib with white cheeks. The back, wings and tail are gray. It is pale below, often with buffy flanks. It is found in deciduous and mixed deciduous-coniferous forests, swamps, open woods and parks in urban and suburban areas. It gleans insects and spiders from tree and foliage and bark, often hanging upside down to do so. It also eats seeds and fruits, wedging them with its feet against a perch, and pecking into them. Both species of Chickadees often hide food in different locations and return to eat it later. Carolina Chickadees are often monogamous for more than one nesting season. Both male and female excavate or choose an existing tree cavity, usually at least 5 feet from the ground. The female builds a nest of moss, lined with a thick layer of mammal hair or strips of plant fibers. In Tennessee, nesting begins in mid-March and peaks in early April. Incubation period: Only the female incubates the eggs for 12-15 days. The male feeds his mate during incubation and sleeps in a nearby sheltered perch. Nestlings are fed by both adults and fledge is 17-18 days. Fledglings remain with parents for another 2 weeks. Chickadees have a fabulous memory. They hide thousands of food items in different locations and are able to return later and remember where nearly all of them are. 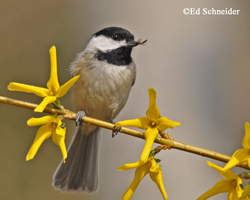 Male and female Carolina Chickadees can remain paired for several years. Probability of pair bond maintenance appears to depend on population, with nearly all pairs remaining together in subsequent years in Texas, but only half staying together in Tennessee. In attempts to obtain the best male, a female may seek out a new male on a different territory if a nesting attempt fails. Preferred box design for Carolina Chickadee is slightly smaller than the NABS Eastern Bluebird box with a 1 ¼ inch entrance hole. This box design may also be used by Tufted Titmice, White-breasted Nuthatches, House Wrens, and Prothonotary Warblers. To attract Carolina Chickadee, place your box in a more wooded area than recommended for Eastern Bluebirds. Place the box near woods, shrubs, and thickets, which are used for foraging and hiding from predators. Farms or barnyards where animals are fed are not recommended sites for boxes because these are attractive to House Sparrows. Avoid placing your box where pesticides or herbicides are used. Mount the box so that the entrance hole is about 5 ft. from the ground and facing, if possible, to the east, away from direct summer afternoon sun and from north winds that may drive rain into the box. A tree or shrub that is within 100 feet of the box will provide a perch for the adults and a safe spot to land for the fledglings' first flight. If you plan to put up multiple boxes in an area, we recommend placing boxes at least 100 yards apart to reduce competition between Carolina Chickadees and other species. Squirrels or woodpeckers sometimes damage the entrance hole, making it larger and allowing undesirable species to enter the box. This can be resolved by placing a copper or other metal hole- guard (available at hardware or wild bird retailers) over the damaged hole. A block of 1.5" hardwood with an entrance hole made and placed over the original hole will also work. To prevent doing more harm than good, do not install a box if you do not plan to monitor it. Check the box once a week during the nesting season to monitor status of bluebirds or other native nesting species, check for leaks and damage on the box, and provide you with a wonderful education. Keep in mind that even the perfectly built and placed box may not attract a breeding pair the first year. If after two years of not having native birds nesting in your box, you may want to move it to another site.